VietPress USA (Jan. 3rd, 2018): Stephen Bannon was the most influenced to Donald Trump during the past year. On August 17, 2016, in the later months of Donald Trump presidential campaign, Bannon joined Trump's 2016 presidential bid, taking the position of chief executive officer. Prior to taking a leave of absence in August 2016, he had been executive chair of Breitbart News, a far-right news, opinion, and commentary website which he described in 2016 as "the platform for the alt-right". According to Wikipedia, when Trump won the 2016 election, Bannon become the White House Chief Strategist (a newly created position) in the administration of U.S. President Donald Trump during the first seven months of Trump's term. In this capacity, he attended the Principals Committee of the U.S. National Security Council from January 28, 2017 to April 5, 2017. Bannon left his position in the Trump administration on August 18, 2017; he then rejoined Breitbart News. Since leaving the White House, Bannon has "declared war" on what he describes as the establishment Republican party, and supported insurgent candidates in Republican primaries. He actively supported Roy Moore in both the Republican primary and general election of the 2017 United States Senate election in Alabama. Following Moore's loss of what was considered a safe Republican seat, Bannon's reputation as a skilled political strategist has been questioned by Republican commentators, including President Trump. Bannon was an officer in the United States Navy for seven years in the late 1970s and early 1980s, serving on the destroyer USS Paul F. Foster as well as at the Pentagon. After his military service, he worked at Goldman Sachs as an investment banker in the Mergers and Acquisitions department. When he left the company, Bannon held the position of vice president. In 1993, he became acting director of the Earth-science research project Biosphere 2. In the 1990s, he became an executive producer in the Hollywood film and media industry; he produced 18 films between 1991 and 2016. A self-described economic nationalist, Bannon advocates for reductions in immigration, restrictions on free trade with China and Mexico, and an increased federal income tax for those earning incomes of over $5 million a year. Bannon is a skeptic of military intervention abroad and has opposed proposals for the expansion of U.S. involvement in Afghanistan, Syria, and Venezuela. He has been widely described as a white nationalist, but rejects the description. Steve Bannon now writes his book "fire and Fury" that blames President Trump and his family on Russia meddling and others. Lawyers of President Trump official sent to Steve Bannon a letter requesting Bannon to stop his articles related to President Trump and his family members. Steve Bannon no doubt hoped that Roy Moore’s loss in the Alabama senate race would be no more than a speed bump in his political battle with Senate Majority Leader Mitch McConnell. But now, in the wake of President Trump’s bone-rattling rebuke of Bannon on Wednesday (in response to Bannon’s provocative remarks about the Trump campaign, as quoted in a new book), the Moore debacle is taking on more the appearance of a train wreck. It weakened Bannon’s standing with Trump’s base, giving McConnell an opportunity to redirect Trump’s ire from himself to Bannon. The label of “Trump’s enemy on the right” has now been firmly planted on Bannon’s chest, after Trump denounced his former adviser on Wednesday in a 266-word statement that was unique in the annals of presidential history for its level of vindictive rage. 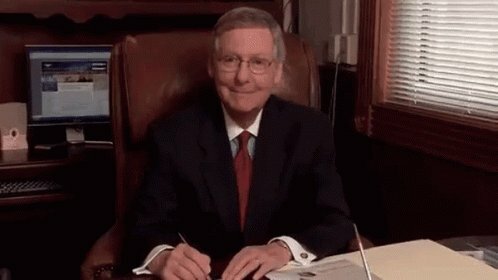 McConnell’s personal campaign arm tweeted out an animated picture of the majority leader sitting behind his desk and breaking into a wide grin. 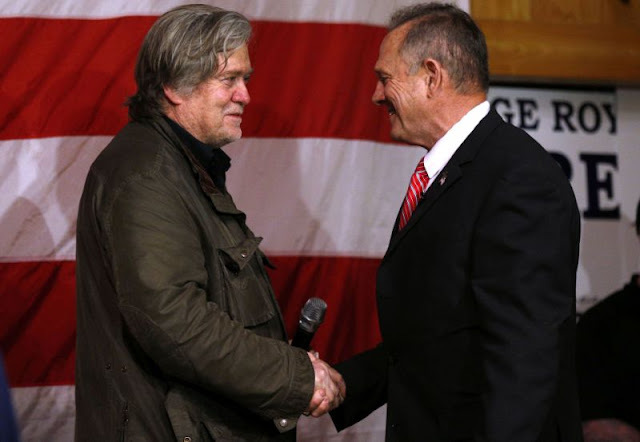 Immediately after Moore’s loss to Democrat Doug Jones in the special election for the U.S. Senate, McConnell’s allies moved to label Bannon — who supported Moore against Trump’s candidate, Luther Strange, in the Republican primary — as the chief impediment to Trump’s agenda. “Not only did Steve Bannon cost us a critical Senate seat in one of the most Republican states in the country, but he also dragged the President of the United States into his fiasco,” wrote Steven Law, who runs a super-PAC aligned with McConnell, the Senate Leadership Fund. “I’m going to be his wingman outside for the entire time … to support Donald Trump,” Bannon said. After Moore lost, Bannon was on thin ice, with much less margin for error. He had already violated a red line laid down in October, when his allies said Bannon would only endorse Senate candidates who promised to oppose McConnell for majority leader. Of the candidates with Bannon’s backing, those who signed up for the anti-McConnell crusade tended to be lesser-quality candidates. Bannon’s picks in the most competitive races — such as Matt Rosendale in Montana and Attorney General Patrick Morrissey in West Virginia — were either openly supportive of McConnell or staying out of the fray. The passage of a tax bill by Congress, which Trump signed into law at the end of December, also boosted McConnell’s standing in Trump’s eyes, and thereby undercut Bannon. And on Wednesday, in the aftermath of the Trump eruption, Republican candidates in contested primaries began to exploit Bannon as a wedge issue. Just a few months ago, Bannon’s support was sought after. But on Wednesday, it was treated as a liability. According to the excerpts, Bannon went on to say he was certain that the Russians at the now-infamous meeting at Trump Tower were introduced to the candidate himself — directly contradicting Trump’s numerous assertions that he had no contact with Russians during the campaign.